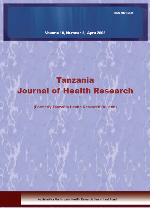 The Tanzania Journal of Health Research (formerly the Tanzania Health Research Bulletin) is published twice a year as an organ of the Health User's Trust Fund (HRUTF), whose mission is to promote in Tanzania the Essential National Health Research Initiative, and in particular demand driven health research. The journal is targeted at all readers interested in health research issues in Tanzania, including priority health research, its planning, funding, implementation, and utilization of findings. It is also aimed at non-specialist scientists, policy and decision makers and the general public. For volumes published before 2008, please see Tanzania Health Research Bulletin.